Finally at 0200 GMT this morning, Banque Populaire swung her three bows NNE, not yet on course for the finish line between the Le Creac'h lighthouse on Ushant and the Lizard, but at least this has caused her VMG to the finish line to soar. Her lead over Jules Verne Trophy record holder Groupama 3 has continued to dwindle - down to 822 miles at the time of her course change, however since then it has been on the rise again. The reason for Banque Populaire's monster detour is quite evident from the chart above, with a large area of high pressure to be avoided at all costs to her northeast. The crew are hoping over the course of today to key into the southwesterlies preceeding the front associated with the depression currently centred northwest of Newfoundland. But of more importance is what the area of high pressure is up to. The high looks set to be quite robust for the rest of this week. There is a depression forming off the eastern seaboard of the States over the course of today which will move northwest, as the depression to the NW of Greenland heads northeast towards Greenland. The effect of this is that the high will continue to remain sizable, centred between the Azores and Portugal for the rest of the week. 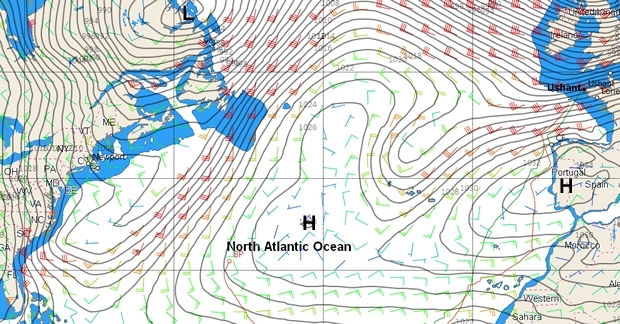 So to avoid this, Banque Populaire is going to have to continue taking her circuitous route around the high, which is why skipper Loick Peyron yesterday said they were likely to be passing the Fastnet Rock en route to the finish line, or coming at it from the northwest rather than the southwest. Fortunately, as anyone in the UK today will asset - there is a lot of wind out there and assuming the high doesn't do anything untoward, the 40m long trimaran is unlikely to run out of pressure between now and her estimated finish time - sometime on Friday night. Yesterday Xavier Revil reported: "Within 12 hours, we will be back up to speed again will be 'taking the train, the TGV itself', which will take us home. We have been on starboard tack for a week or so and it will stay like that as we round the high pressure. This is the longest time I've on starboard tack in career."